5 PartWCS Intensive! – This 5 part course covers all the hot topics to help take your WCS to the next level. 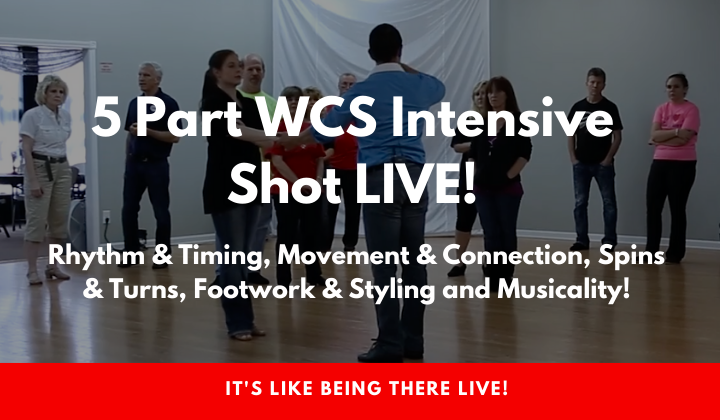 Learn more about, Rhythm & Timing, Movement & Connection, Spins & Turns, Footwork & Styling and Musicality! Over 4 hours of video shot live from our “One day to better WCS” live workshop. This is a unique way to learn online. If you are looking to improve your WCS dancing, Look no further. This unique videos series covers all of the most important WCS topics. Order NOW!